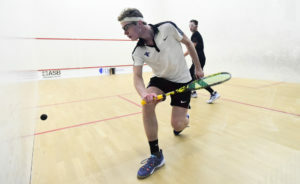 Franklin & Marshall Men’s Squash finished up their first semester season on December 1. The Diplomats went 5-1 in the months of November and December to start off the 2018-2019 season on an extremely high note. In the 2017-2018 season, the Diplomats went 5-15 on the season, going 1-6 through the months of November and December. This spectacular turn-around shows that the Diplomats are ready to have a comeback season and be a contender in the CSA Team Championships at the end of February. The No. 17 Dipomats faced off against the No. 6 UPenn Quakers in their first match of the season in the PA Cup. The Diplomats lost 0-9. While Sophomore Sanjay Jeeva and First-year Ned Mylod were able to force their matches to go into four sets, all of the other Diplomats lost to their Quaker opponents in three sets. F&M did not get discouraged after their first lost. They played for 3rd place in the PA Cup against No. 18 Dickinson, and defeated Dickinson 7-2. No. 1 Junior, Shams Abbas, lost in 4 sets to his Dickinson opponent. Although Abbas lost the first two sets, he battled back to win the third set, yet lost in a hard-fought fourth set 15-17. Both No. 2 Jeeva and No. 5 Mylod defeated their opponents in 5 sets. First-year Matthew Dukarm, Junior Boden Polikoff, First-year Aryan Parekh, and Senior Ricardo Machado all defeated their opponents in 3 dominating sets. The Diplomats continued their dominance against No. 22 MIT in another 7-2 victory. Junior Yannis Senkel lost in the first set against his opponent, yet fiercely battled back to win the next three sets: 11-6, 11-4, 11-5. Senior Silvio Soom also lost in a long first set against his opponent 18-20. However, he was able to dominate and win the following three sets: 11-5, 11-9, 11-5. Senior Ricardo Machado also won in four sets. Junior King Bassett defeated his opponent in a hard fought three sets, 11-8, 12-10, 11-5. Franklin & Marshall cruised past Bates in their fourth game of the season, winning 9-0. No. 1 Abbas lost in the first set to his opponent 3-11. However, Abbas won the next three sets with ease. The remaining eight Franklin & Marshall players all defeated their opponents in 3 sets. The Diplomats dominated in their match against Connecticut College with a 7-2 victory. Three players (Soom, Parekh, and Dukarm) all defeated their opponent 11-1 in one of their 3 sets. Parekh had an excellent match, as he defeated his opponent, 11-1, 11-2, 11-3. Both No. 8 Sophomore Brahm Brooks and No. 9 Sophomore Chris Taylor fought hard against their competitor; however, they were both ultimately defeated in 5 sets. The Diplomats finished strong in their final match of the semester, defeating Wesleyan 9-0. All Diplomat players defeated their opponent in three sets. In one of the his three sets, No. 3 Mylod held his opponent scoreless in an 11-0 victory. Senior Frank Murray got his first victory of the season. Jeeva and Parekh lead the team with 5 victories and 1 loss each. Machado won all four of the matches he played. Polikoff and Senkel both won 4 matches and lost 2, while Soom won 4 and lost 1. Both Bassett and Mylod won 3 and lost 1. Franklin & Marshall Men’s Squash returns at the end of Winter Break on Friday, January 11 at Hamilton College. The Diplomats hope to continue their dominance and good play in the latter half of the season.